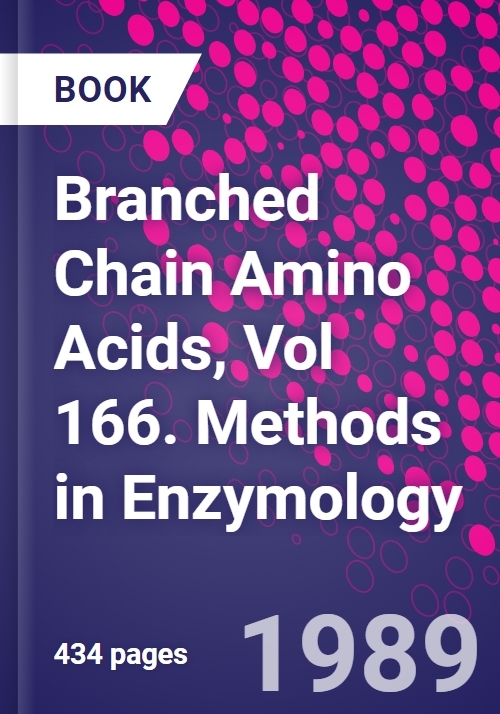 This volume includes chapters on the newest techniques for measuring metabolites of branched-chain amino acids, many new enzyme assays such as the measurement of isozymes of acetohydroxacid synthase, and the purification of recently described enzymes such as isovaleryl-CoA dehydrogenase. Analytical and Synthetic Methods:G. Livesey and P. Lund, Determination of Branched-Chain Amino and Keto Acids with Leucine Dehydrogenase.S.J. Yeaman, K.G. Cook, A.P. Bradford, and S.M.A. Jones, Analysis of Phosphorylation Sites on Branched-Chain 2-Ketoacid Dehydrogenase Complex.D.J. Aberhart and J.-A. Cotting, High-Performance Liquid Chromatographic Separation of (3R) and (3S)-/-Leucine Using Marfey's Reagent.D.J. Aberhart, High-Performance Liquid Chromatographic Separation of ~ga- and /-Leucine.A.L. Gasking, W.T.E. Edwards, A.H. Frohock, M. Elia, and G. Livesey, Quantitative High-Performance Liquid Chromatographic Analysis of Branched-Chain 2-Keto Acids in Biological Samples.O.A. Mamer and J.A. Montgomery, Determination of Branched-Chain 2-Hydroxy and 2-Keto Acids by Mass Spectrometry.P.L. Crowell, R.H. Miller and A.E. Harper, Measurement of Plasma and Tissue Levels of Branched-Chain ~ga-Keto Acids by Gas-Liquid Chromatography.J.A. Montgomery and O.A. Mamer, Determination of Methylmalonic Acid in Biological Fluids by Mass Spectrometry.B.E. Corkey, Analysis of Acyl Coenzyme A Esters in Biological Samples.M.T. King, P.D. Reiss, and N.W. Cornell, Determination of Short-Chain Coenzyme A Compounds by Reversed-Phase High-Performance Liquid Chromatography.K. Bartlett and A.G. Causey, Radiochemical High-Performance Liquid Chromatography Methods for the Study of Branched-Chain Amino Acid Metabolism.J.V. Schloss, R. Magolda, and M. Emptage, Synthesis of ~ga-lsopropylmalate, /-Isopropylmalate, and Dimethylcitraconate.R.A. LaRossa and T.K. Van Dyk, Utilization of Sulfometuron Methyl, an Acetolactate Synthase Inhibitor, in Molecular Biological and Metabolic Studies of Plants and Microbes.D.J. Danner, L.J. Elsas, and S. Litwer, Antibodies against Branched-Chain ~ga-Ketoacid Dehydrogenase Proteins for Use in Defining Human Mutations and Gene Isolation.R.A. Harris, M.J. Kuntz, and R. Simpson, Inhibition of Branched-Chain ~ga-Ketoacid Dehydrogenase Kinase by ~ga-Chloroisocaproate. Enzyme Assay.J.M. Poston, Measurement of Relative Carbon Flux in ~ga- and /-Keto Pathways of Leucine Metabolism.J.M. Poston, Assay of Leucine 2, 3-Aminomutase.D.T. Chuang and R.P. Cox, Enzyme Assays with Mutant Cell Lines of Maple Syrup Urine Disease.D.T. Chuang, Assays of E1 and E2 Components of Branched-Chain Ketoacid Dehydrogenase Complex.Y. Ikeda and K. Tanaka, Mutant Isovaleryl-CoA Dehydrogenase in Isovaleric Acidemia Cells: Assay of Activity and Molecular Characterization.J. Espinal, M. Beggs, and P.J. Randle, Assay of Branched-Chain ~ga-Ketoacid Dehydrogenase Kinase in Mitochondrial Extracts and Purified Branched-Chain ~ga-Ketoacid Dehydrogenase Complexes.P.A. Patston, J. Espinal, M. Beggs, and P.J. Randle, Assay of Total Complex and Activity State of Branched-Chain ~ga-Ketoacid Dehydrogenase Complex and of Activator Protein in Mitochondria, Cells, and Tissues.G.W. Goodwin, B. Zhang, R. Paxton, and R.A. Harris, Determination of Activity and Activity State of Branched-Chain ~ga-Ketoacid Dehydrogenase in Rat Tissues.K.P. Block, R.P. Aftring, M.G. Buse, and A.E. Harper, Estimation of Branched-Chain ~ga-Keto Acid Dehydrogenase Activation in Mammalian Tissues.K.M. Gibson, Assay of 3-Methylglutaconyl-CoA Hydratase.K.M. Gibson, Assay of 3-Hydroxy-3-Methylglutaryl-CoA Lyase.L.L. Searles and J.M. Calvo, Permeabilized Cell and Radiochemical Assays for /-Isopropylmalate Dehydrogenase.J.H. Jackson, Rapid Assay of Acetolactate Synthase in Permeabilized Bacteria.N. Gollop, Z. Barak, and D.M. Chipman, Assay of Products of Acetolactate Synthase.M. De Felice, G. Griffo, C.T. Lago, D. Limauro, and E. Ricca, Detection of the Acetolactate Synthase Isozymes I and III of Escherichia coli K12.T.K. Antonucci and D.L. Oxender, Transport of Branched-Chain Amino Acids in Escherichia coli.M.S. Kilberg, Transport of Branched-Chain Amino Acids and Their Corresponding 2-Keto Acids by Mammalian Cells.A. Hampel and R. Tritz, Leucine-tRNA Ligase Complexes. Enzymes.T.K. Korpela, Purification of Branched-Chain-Amino-Acid Aminotransferase from Pig Heart.R. Kido, Pancreatic Branched-Chain-Amino-Acid Aminotransferase.G. Livesey and P. Lund, Isolation and Characterization of Leucine Dehydrogenase from Bacillus subtilis.P.J. Sabourin and L.L. Bieber, Purification and Assay of ~ga-Ketoisocaproate Dioxygenase from Rat Liver.D.J. Danner and S.C. Heffelfinger, Isolation of Branched-Chain ~ga-Ketoacid Dehydrogenase as Active Complex from Bovine Liver.K.G. Cook and S.J. Yeaman, Purification, Resolution, and Reconstitution of Branched-Chain 2-Ketoacid Dehydrogenase Complex from Bovine Kidney.F.H. Pettit and L.J. Reed, Branched-Chain ~ga-Ketoacid Dehydrogenase Complex from Bovine Kidney.R. Paxton, Rabbit Liver and Heart Branched-Chain ~ga-Ketoacid Dehydrogenase and Its Kinase.Z. Damuni and L.J. Reed, Branched-Chain ~ga-Ketoacid Dehydrogenase Phosphatase and Its Inhibitor Protein from Bovine Kidney.R.N. Perham and P.N. Lowe, Isolation and Properties of the Branched-Chain 2-Ketoacid and Pyruvate Dehydrogenase Multienzyme Complex from Bacillus subtilis.J.R. Sokatch, Purification of Branched-Chain Ketoacid Dehydrogenase and Lipoamide Dehydrogenase-Valine from Pseudomonas.P.J. Sykes and J.R. Sokatch, Cloning of Genes for Branched-Chain Ketoacid Dehydrogenase in Pseudomonas Putida.Y. Ikeda and K. Tanaka, 2-Methyl Branched-Chain Acyl-CoA Dehydrogenase from Rat Liver.Y. Ikeda and K. Tanaka, Isovaleryl-CoA Dehydrogenase from Rat Liver.K. Hatter and J.R. Sokatch, Purification of Methylmalonate-Semialdehyde Dehydrogenase from Pseudomonas aeruginosa PAO.R.J. Kovachy, S.P. Stabler, and R.H. Allen, D-Methylmalonyl-CoA Hydrolase.S.P. Stabler and R.H. Allen, DL-Methylmalonyl-CoA Epimerase from Rat Liver.J.F. Kolhouse, S.P. Stabler, and R.H. Allen, L-Methylmalonyl-CoA Mutase from Human Placenta.G.B. Kohlhaw, ~ga-Isopropylmalate Synthase from Yeast.G.B. Kohlhaw, Isopropylmalate Dehydratase from Yeast.G.B. Kohlhaw, /-Isopropylmalate Dehydrogenase from Yeast.L. Eoyang and P.M. Silverman, Purification and Assays of Acetolactate Synthase I from Escherichia Coli K12.J.V. Schloss and D.E. Van Dyk, Acetolactate Synthase Isozyme II from Salmonella typhimurium.Z. Barak, J.M. Calvo, and J.V. Schloss, Acetolactate Synthase Isozyme III from Escherichia coli. Use of Animals and Animal Organs in the Study of Branched-Chain Amino Acid Metabolism.G.E. Mortimore and A.R. Pvsv, Amino Acid Control of Intracellular Protein Degradation.E.J. Davis, S.-H.C. Lee, ~alO. Spydevold, and J. Bremer, Use of Rat Hindquarter Preparations in Studies of Branched-Chain Amino Acid Metabolism.D.S. Lapointe, E. Hilderbrandt, D.B. Buxton, T.B. Patel, P.P. Waymack, and M.S. Olson, Measurement of Branched-Chain ~ga-Ketoacid Dehydrogenase Flux Rates in Perfused Heart and Liver.